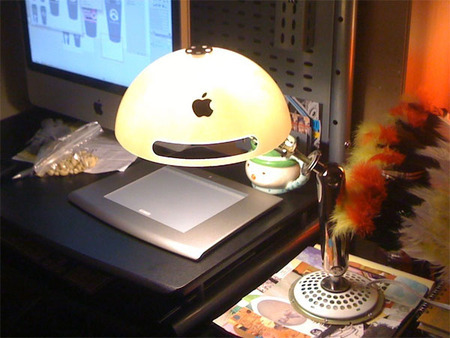 One for the fan-ladies and fan-gents out there: an Apple desk lamp. Not made by Apple, no, they don’t do that, but this piece of desk furniture is paying homage to Apple with every gram of its sturdy frame. Incredibly made out of a recycled iMac, the iMac G4 lamp possibly references steampunk in its sturdy Victorian look and bears the pround mark of the Apple logo on its lampshade. Full marks for green craftmanship to the Etsy artist Randall180 who created this gem. He has also made an iMac G4 clock. Awesome! Will you be posting the directions on how to make these? My mother is going to be 80 yrs. old and she has been a diehard Mac user since their inception. Great job! and Go Green!